I've received several suggestions to clarify all the guest bloggers and people (personas) I write about here on my blog. I am happy to oblige and intend over the next few days to create a separate page to explain who all is here and provide some background information on them. I'll attempt, as best I can, to provide a history for Thorn Goblinfly, chief scribe for the garden fairies. I'll need to interview her, if she's even talking to me by then. She still has not gotten over my leaving the hot, humid, record setting weather of Indianapolis for the cool of Seattle, even though I was only gone for a few days. 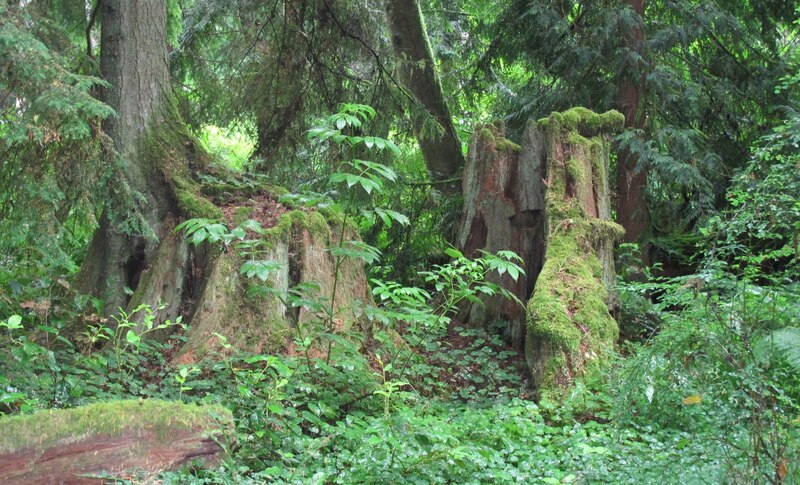 I don't help my case for mending the rift with Thorn when I post pictures like this one from The Bloedel Reserve on Bainbridge Island. If there was a "garden fairy detector meter thingie", it would have gone wild at this spot, where clearly there were garden fairies. Clearly. Thorn would admittedly love it there, and I like to think she was there in spirit. She's not buying the "there in spirit" thing, by the way, because she's a garden fairy as she likes to remind people over and over and over again when she posts. In addition to Thorn, I may list off a few other garden fairies who have at least been written about here, including Ol' Rainbow Tanglefly and Sweetpea Morningdew. Dr. Hortfreud has also agreed to provide some history and list her credentials as a gardenerapist. It will be nice to turn the tables and have her explain to me what's on her mind rather than me spilling my guts to her, yet again. 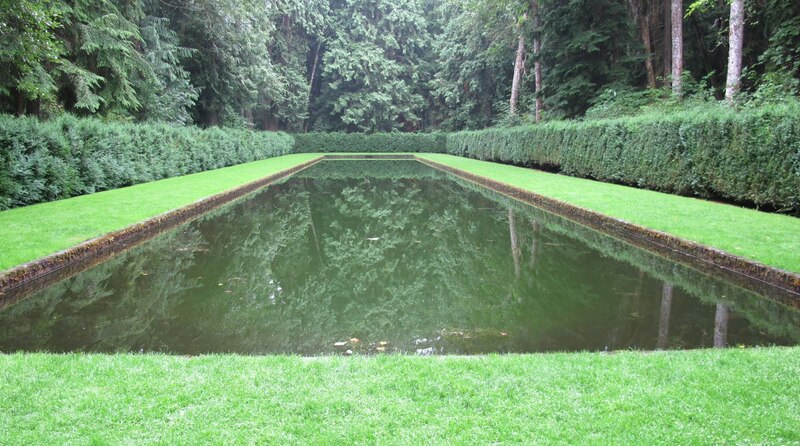 She very much approved of this reflecting pool at The Bloedel Reserve. I've never before encountered a garden spot like this one where I immediately felt it necessary to whisper so as not to disturb the peace around me. I need to discuss with Dr. Hortfreud why that is. I'll also write about Hortense Hoelove in a Q&A format because that's what she's requested. It is always best to do things Hortense's way because, well, it just is. If she shows up and I can talk to her without her disappearing on me the minute my back is turned, I'll also explain who The Old Woman at the Door really is, though regular readers have already figured it out. 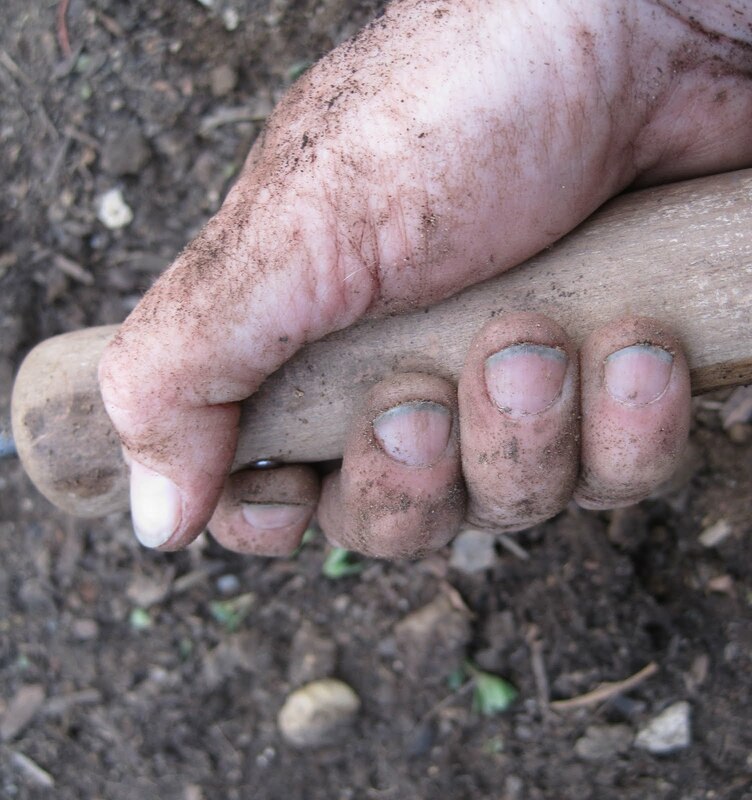 Here's a picture of her holding a hand digging hoe, if you need a clue. Someone should wear gloves in the garden. I won't forget to include Gloriosa Vanderhort, my new stylist who is rather appalled at the state of the hand holding that hoe. Filthy! Though Gloriosa (yes, like the daisy) Vanderhort (yes, like the designer) is new around here, I think she'll fit in well with the others. Have I left anyone out? Oh, wait, there are those darn rabbits! I think someday I'll create a special page just for them because there seem to be quite a few of them and they are multiplying as rabbits do. Yes, they need a separate page. Once I have these pages set up, it will be easy to say "I can explain" to new readers who must wonder sometimes what is going on here at May Dreams Gardens. I wonder myself, sometimes. The pages will answer all, or at least some, of the questions. There's also the possibility that they will include some other personas not yet featured in any posts. And as a bonus, I may finally explain what the Green Bandana Garden Club is all about. I'll bet the woman at the door is wearing green! Can't wait to see the bios of all our good friends on your blog. I don't have garden fairies in my garden (that I know of), only chickens. I have 6 and they all have different personalities. In fact, I'm learning to speak chicken. There are 16 'words'. The word for 'there's a hawk overhead' is CLUCK! said very sharply and emphatically. This makes everyone look up with one eye pointing to the sky. I've not done this at a bus stop yet, but I might. We await the explanations with bated (contraction of abated) breath, Carol. I agree, the Bloedel Reserve was a place full of magic, majesty and fairies. Quite a cast of characters you have there at May Dreams. I may have a guess about the GBC but await your explanation. Here in Minneapolis where it has also been nightmarishly hot, my garden is still full of the Squirrels and their Allies. Thank goodness the faeries are watching and let me know what they are up to! Surprisingly, my two terriers live happily amongst the faeries in fact I've long know that one of them, Lily, can hear them as evidenced by the way she stares off and listens while sitting in the flowers. She also knows when storms are coming. The other, Meike, is convinced that the reason her toys are always is missing is that the faeries are playing with her. She has enlisted faery help in chasing the neighborhood cats who hunt in the garden. Looking forward to hearing about all the residents of May Dreams. I am sure glad to read this. I went away for a coupla years and when I came back, I didn't know WHAT was happening, here! Now I understand completely...!